Come and shop with the best Ford dealer in Wisconsin, Ewald's Venus Ford, if you want to find the highest quality used cars under 5000 in Cudahy WI. Here with Ewald's Venus Ford, you can easily find the best used cars under 5000 for sale right here at the best dealer near you! Ewald's Venus Ford's used cars for sale under 5000 do not sacrifice quality or performance for a lower price tag, as our vehicles for sale in Cudahy Wisconsin still remain as beautiful, reliable, and efficient cars to drive on the road with, meaning that our customers can get a fantastic deal on a wonderful used vehicle, all for a price that is easy on the wallet! So come in to your local Ford dealer, Ewald's Venus Ford, and take a look at our best used cars under 5000 for sale today! Our used cars for sale under 5000 still have much to offer you, other then their super affordable price, as our used cars under 5000 still come packed with many features and options that will provide you with a smoother, safer, and more enjoyable time driving these cars. 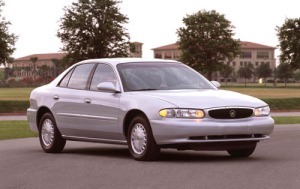 So take a look at our used car inventory and test drive a car today, like this used car for sale under 5000, the used 2005 Buick Century Base! This used car still has a lot of speed and power to offer you, as well as many wonderful features to take your breath away! Features like its 3.1L 3100 V6 SFI Engine that easily gets you up to a zippy 175 Horse Power, providing you with plenty of speed to use at will, and its Adjustable Steering Wheel that will help you get into the perfect and most comfortable driving position. You will also enjoy its Keyless Entry that will provide you with easy, hassle free access to your vehicle any time. So come in to the best Ford dealer in Cudahy WI, Ewald's Venus Ford, and take a look at our awesome used cars for sale under 5000, all at our location at 2727 E Layton Ave. Cudahy, WI 53110!